Lean production techniques, just-in-time delivery and reengineered corporations have forever changed the rules of logistics management. Having what’s needed, when needed, and in the appropriate quantities has become more difficult and complex. And for those companies providing logistics services, the competition to attract and keep customers has done everything but become simpler. Logistics is about service. Competition is no longer restricted to delivering the best and most cost effective form of warehousing, packaging, shipping, local delivery or other contracted services. Providers are now judged on how well their business models and back-office systems conform to and support the needs oftheir customers. LogicSmart’s analysis of their clients’ needs led them to venture beyond the services they traditionally had been providing. Their industry knowledge and deep insights into the needs of their clients allowed LogicSmart to recognize areas where they could engage to significantly improve their clients’ processes; and in turn, gain both a competitive advantage and bind their clients more tightly through the uniqueness of their new service offering. Many of the shipments handled by LogicSmart originate in plants in mainland China resulting in the need to track the shipment from the initial trucking company to export packing to maritime transport to US customs to intermodal trucking and potentially through a US over the road trucking firm to the final receiving dock. To allow their customers to track these shipments, LogicSmart developed a specialized data acquisition and display application. LogicSmart’s application allows their customers to provide information on shipments to be tracked and the carriers that are being used. LogicSmart’s application then logs onto the web sites of each carrier in the logistics pipeline and acquires information on the shipments being tracked. This information is aggregated and stored in a database. Another component of the application presents the customer with current status and location of their shipment. 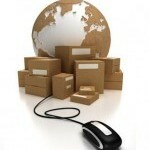 LogicSmart’s application simplifies tracking shipments. Two shipments can leave the same manufacturing plant bound for the same destination at the same time but using entirely different carriers and yet LogicSmart’s application provides the same information on both shipments. LogicSmart’s application provides a straight forward approach to simplifying a very complex process and eliminates a large amount of manual effort in tracking goods from plant to final destination yielding more timely, accurate and usable information. The benefit to LogicSmart is that they have been able to attract additional customers due to the value their customers assign to being able to more easily track their shipments as they cross the globe and pass from one transportation firm to another. *We are using the name “LogicSmart”, as the actual company name is being omitted for the purpose of this story.